The latest craze – join me on Periscope! No. But I made a quilt called Not Everything is Black and White. 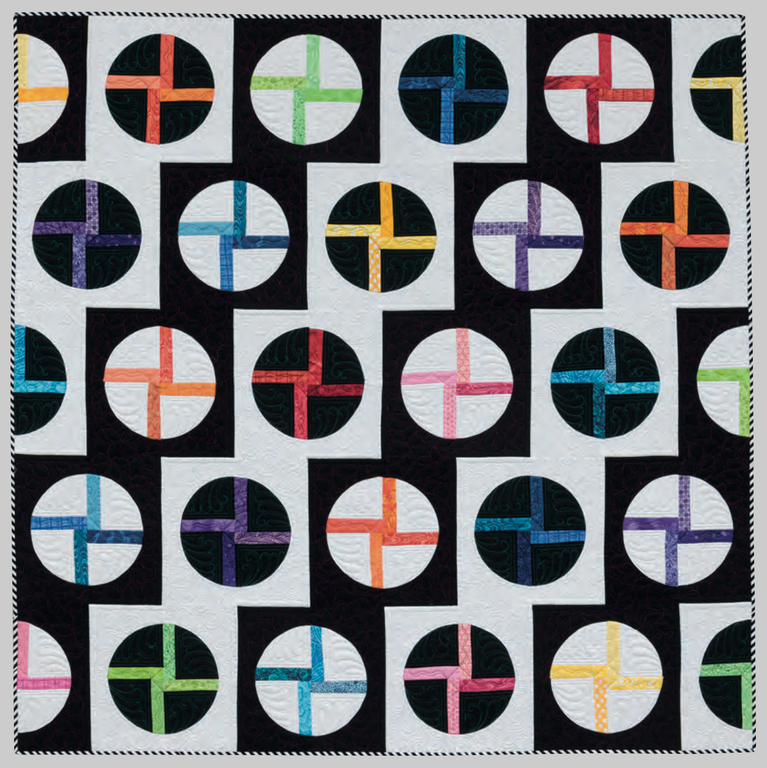 The quilt is very colourful, but the backing is black and white. I thought I was quite clever. 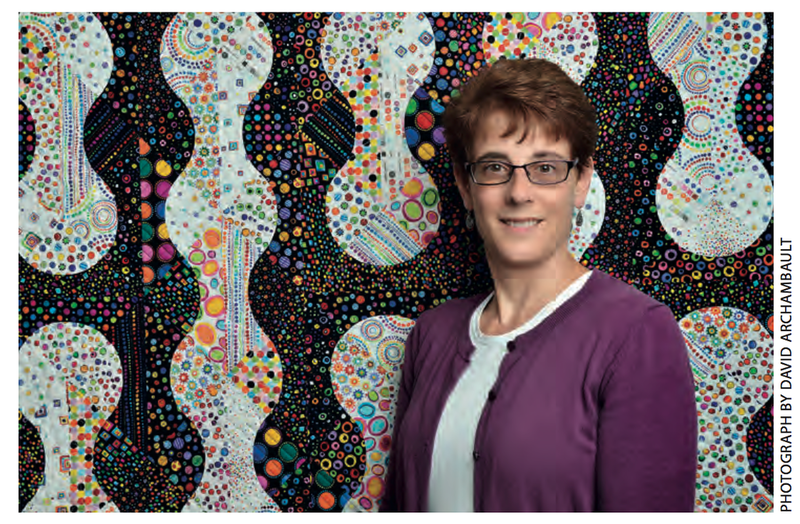 🙂 Jackie has some gorgeous quilts in her book. I made a black and white quilt for my hubby. No color added, just black and white fabrics! Yes, I made a black, white, and gray quilt for my brother’s 50th birthday last October. No additional colors at all, not even on the back. It turned out very cool! 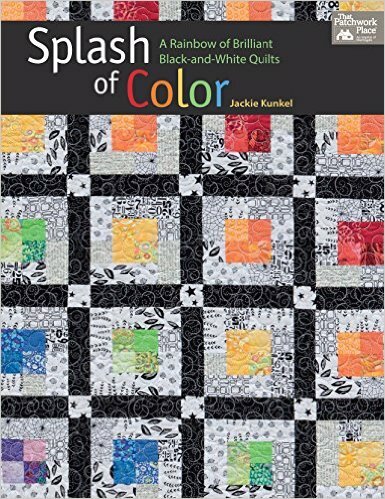 I have never made a black and white quilt but after seeing the ones from the book, I think I have just added another item to my to do list. I made a black and white bow tie quilt that included some bright colors as the knots. Dramatic! I have been collecting B&W fabric for a quilt I want to make. Does that count? Quilt. I was just looking for the right pattern. I ‘m so glad you have pointed me in the right direction. Yes, I made a black & white cal- King that is on our bed. It’s a favorite of mine. I had only been quilting about a year and a half when I made it. I love both of your books. 🙂 Yes, I have! 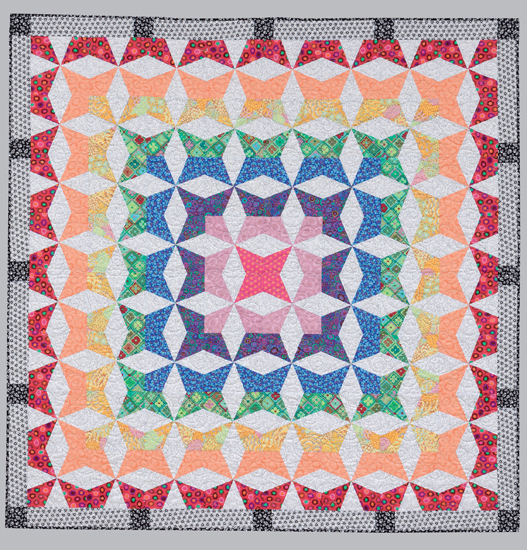 One of the very first quilts I made was in our second year of marriage, as a large-scale Log Cabin quilt-in-a-day retreat several of us lonely young wives made at the military medical school. 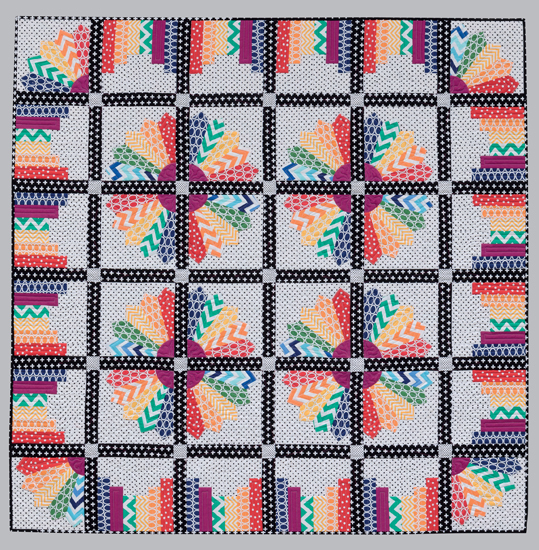 It was the early 90s, and while most quilts that day were made in country pinks, blues, and greens, I wanted something striking and different. So my fabrics were whites and blacks with the gradations for the log cabin coming from the prints thereon in subtle plays of purple and gray. It’s a tired, worn, and faded quilt now, but still one of the favorites that I’ve made. I’ve planned a black and white quilt, but haven’t found a pattern I like. I bet there I’d one I’ll love in this book. I made a black & white & red quilt, a few years ago, and loved it. I donated it to our local library, as it had newspaper fabric on the back, which is read, (also red). I’ve never made a black and white quilt before but man, now I want to! I love the seeing spots one. It’s just stunning. 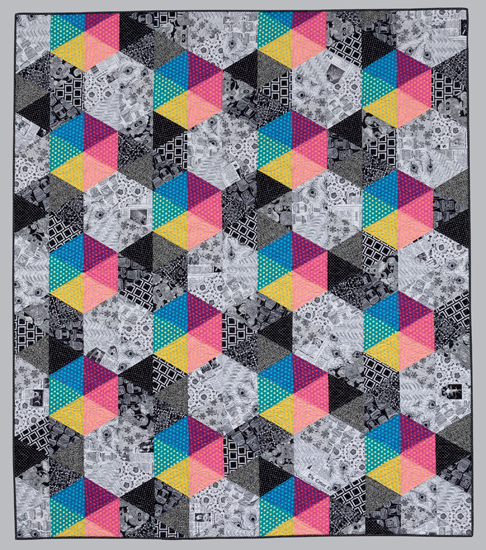 I’ve made a triangle quilt before but I love the 3 dimensional feel of that one with the bright pops of color. No I haven’t as yet but think I might give it a try. Inspiration is good! I have made a blsck & white quilt with Silver for a silver anniversARY. Yes, I have made a black@white wall hanging in a blog hop one year ago. Well, not completely B&W, I added a little bit of red for interest: a sun, red legs on a cow and a braided white and red cows tail! I like a Black and white quilt but I usually add just a splash of red. I just made one for my son about 2 months ago. I’ve made one black and white quilt. It has only a very thin chartreuse border, otherwise the top is all black and white. The back is also primarily black and white, but there are additional colored fabrics added. 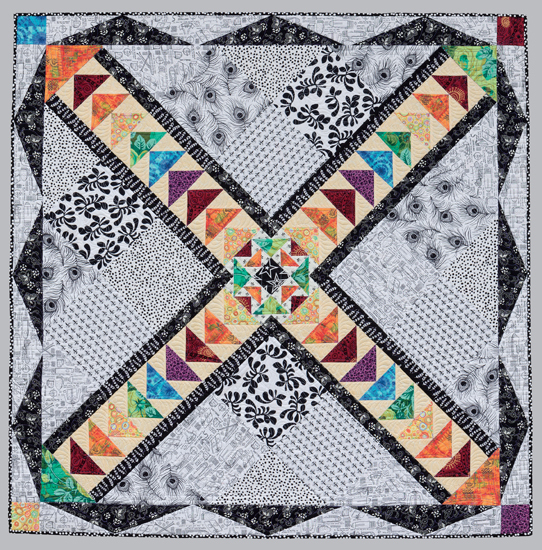 And I have quite a collection of black and white fabrics, so I feel like it’s about time for the next black and white quilt.